The pen for this review was provided by Pen Habit viewer, Drew, who lent this pen to me during the summer of 2014. I’m just now posting the video (ergo the old background) but the pen was returned to him shortly after recording the video. I am not much of a pen historian. Nor, as I have mentioned many times in the past, do I focus much on vintage pens or vintage pen collecting. 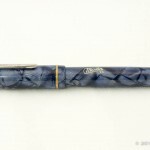 I enjoy vintage pens, particularly those still in superb condition, but I find myself more often drawn to modern pens when I am looking for a place to blow some money. 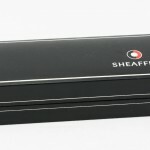 In the vintage pen arena, one of the most respected names is Sheaffer. 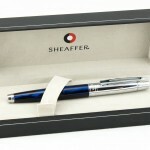 Fully-restored versions of vintage Sheaffer pens sell for hundreds of dollars online and in pen shows. They are certainly lovely-looking pens, with unique and interesting filling systems. And, from what I’m told, excellent nibs. 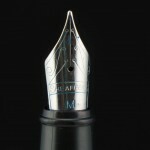 I have never been fortunate enough to get my hands on a vintage Sheaffer pen that really captured my attention. I did purchase a 1970s era (I refuse to call anything made in the same decade I was born “vintage”) Sheaffer Imperial 330 that wasn’t much in the looks department, but did have a lovely nib. 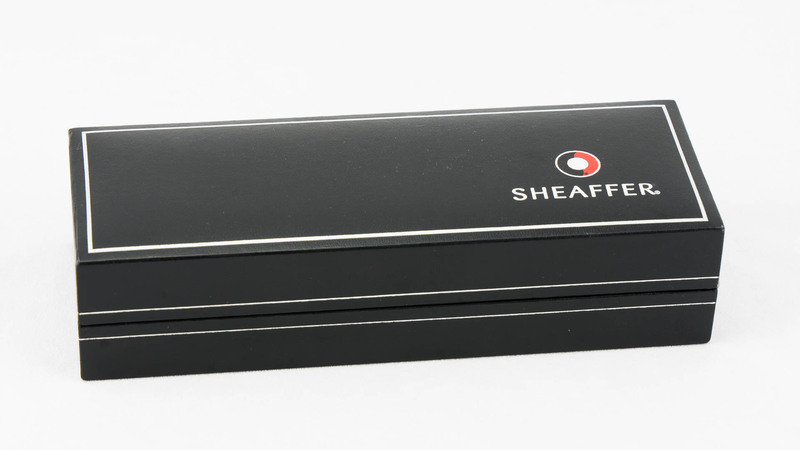 The Sheaffer name is still around, of course, but my impression of the brand’s modern pens, gleaned from the various online communities, is that the modern Sheaffers–especially the lower end options–simply aren’t up to snuff with the vintage offerings from the brand. That impression, combined with the fact that none of the modern Sheaffer designs speak to me, has caused me not to focus too heavily on them when determining my next acquisition. 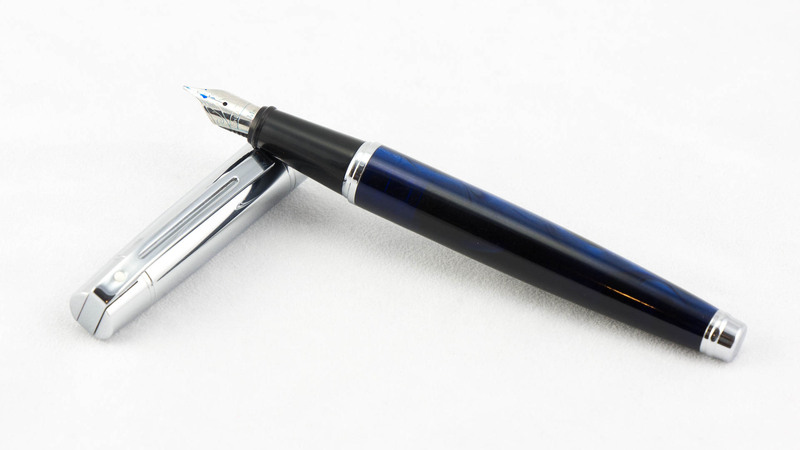 The Sheaffer 300 is a fairly heavy, metal-bodied pen. It comes in a variety of different colors and finishes. 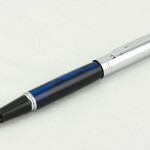 The model that I received was the iridescent blue version with a chromed cap and accents. In the hand, the pen feels really solid: It’s heavy-enough that you could probably crack someone’s skull with it if you threw it at them from across the room. 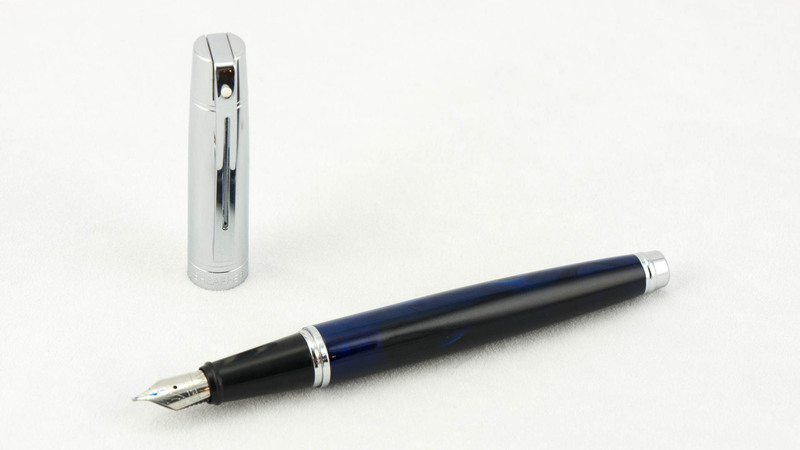 The barrel of the pen is a painted/lacquered metal that tapers toward a flat, chromed finial. 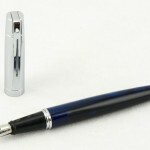 The finial has a little lip around it which assists in ensuring a secure posting of the pen. 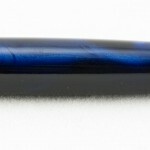 The color of the iridescent blue version of the pen is nice, and shows a little motion. This particular color is not one of the more common varieties that I’ve seen online, with most of them being silver, black, solid blue, or red. I prefer this swirly blue over most of the more common colors. The snap-on cap, which by itself is heavier than the weight of the inked pen, is a very shiny chrome that ends in a flat top. The cap can be posted, but because of the aforementioned lip on the barrel finial, the cap does not post deeply, although it does post quite securely. Additionally, because the cap is heavier than the rest of pen, posting makes it extremely back-heavy. I couldn’t use this pen posted for any length of time. One of the most interesting design elements on this pen is the clip. 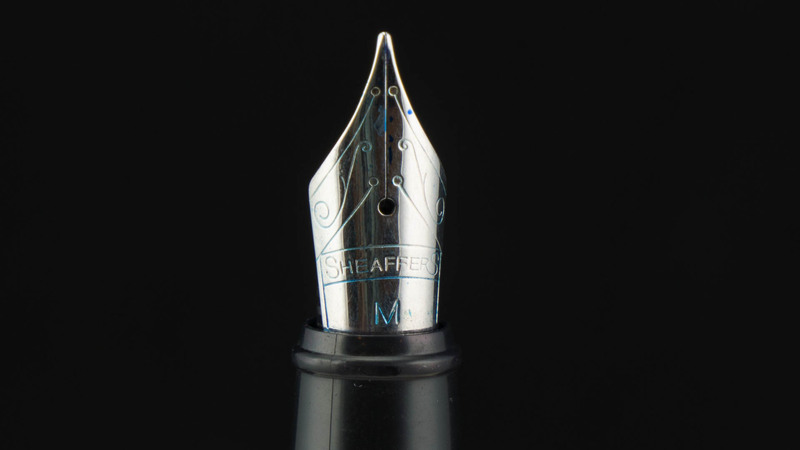 Like many Sheaffer clips, it has the “white dot” at the top of the clip. 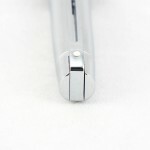 The clip arm has a cutout through which you can see the cap or whatever you’ve got the pen clipped to. It’s a nice little design element. 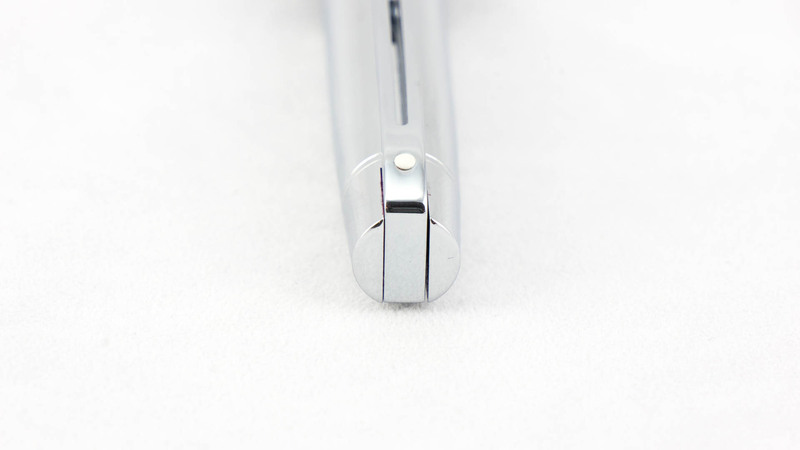 The clip travels up the cap, across a channel in the top, and hinges to the opposite side. It’s spring-loaded but not particularly strong, especially for a pen that weighs as much as this one does. 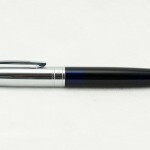 I wouldn’t put this pen in a suit jacket pocket, unless you were certain that coat was going to remain on all day long and you weren’t going to be bending over at the waist. It just doesn’t feel very secure. I should also note that the cap picks up fingerprints like a police CSI unit. 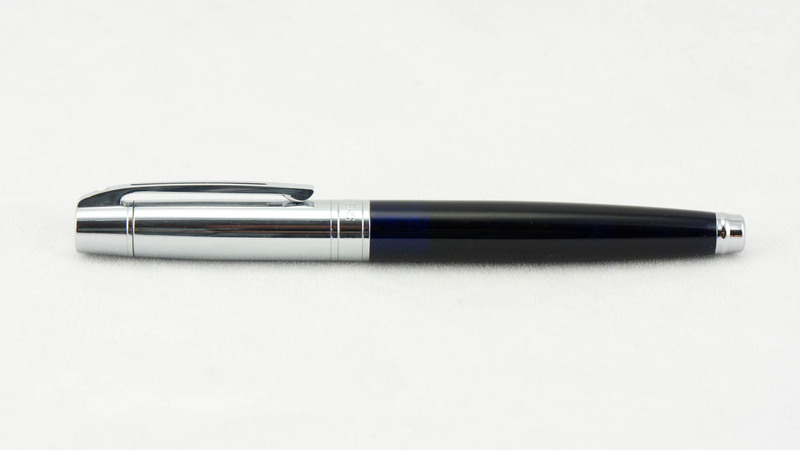 So if, like me, you’re the kind of person who hates it when his pens look grimy, you will likely find yourself polishing the fingerprints off the cap all day long. Removing the snap-on cap, you’ll find a moderate step-down from the barrel to the section. The section is made of plastic, and feels a little flimsy in comparison to the heavy metal of the rest of the pen. It tapers down slightly, then comes to the Sheaffer nib. The steel nib on this pen seems out-of-proportion to me. It feels too small and too squat for the rest of the pen. It’s also a little plain. Despite its appearance, it was a decent, but not great, nib. On the pen I tried, the tines were a bit too close together, causing the pen to run dry. It also needed a hint of smoothing to deal with a bit of scratchiness in one direction. By default, the pen has a bit of feedback, but not so much as to be unpleasant. Once I tackled those things, the pen worked fairly well. It was a fine writer, writing consistently, and without skips or hard starts. 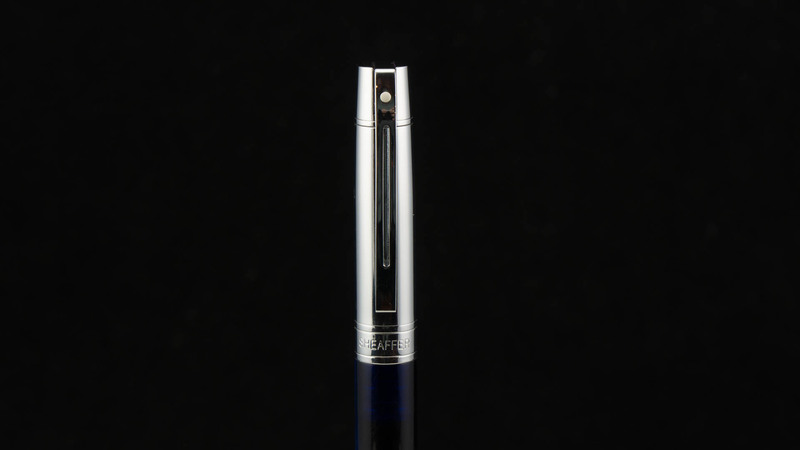 The Sheaffer 300 is a cartridge/converter pen, and comes with a Sheaffer converter and a couple cartridges. 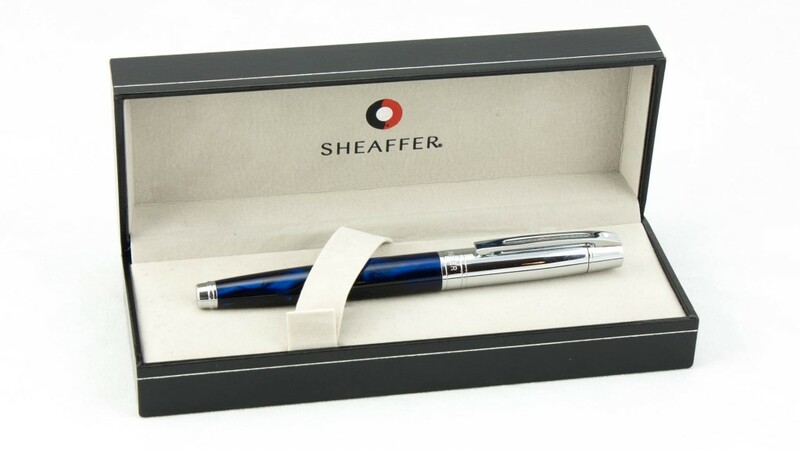 The Sheaffer converters and cartridges are proprietary, so your standard international accessories likely will not work on this pen. In the end, there are a few things about the Sheaffer 300 that kept me from getting too excited about it. Most importantly, the weight of the pen made it tiring to use for long writing sessions. 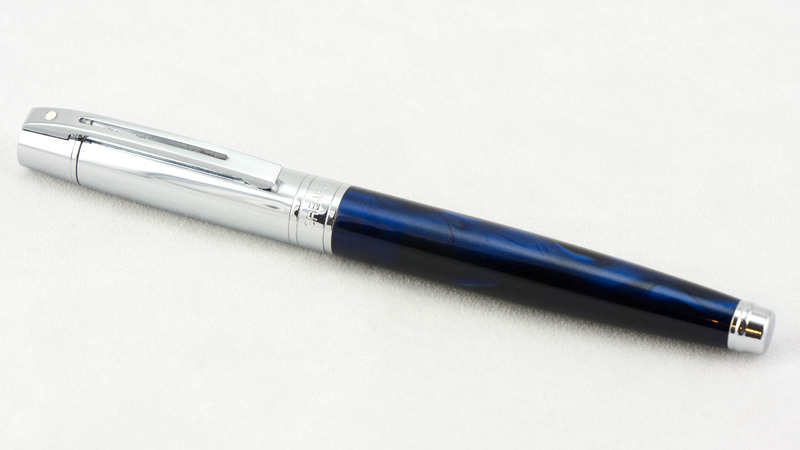 Even if you like a heavier pen, you may want to see if you can get your hands on one of these before buying it, because I found the balance of the pen to be really off. 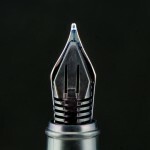 Normally, a pen manufacturer tries to put a bit more weight toward the nib, balancing out the weight of the barrel. In this case, all the weight is in the heavy metal barrel, and the section is made out of a light-weight plastic. Even without posting then pen, its center of gravity was not in the right place for the way I like to write. I found the aesthetics of the pen to be just okay. 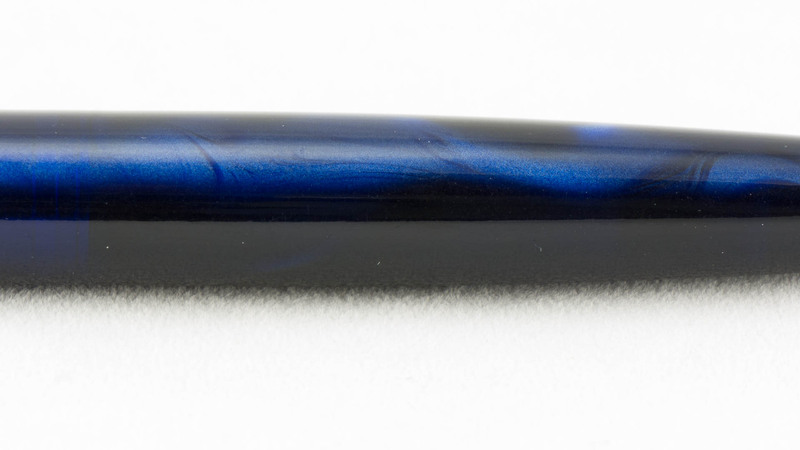 With as many interesting designs and materials out there in modern fountain pens, I found this one to be a little dull. If you’re the kind of person who likes understated pens, this might be right up your alley. As for me and my house, it felt a bit too inspired by 1970s Brady Bunch-style Architecture. It doesn’t feel like a modern design to me, but a minor rehash of a design they’ve been using for 30-40 years—not old enough to be classic, but not new enough to be exciting. 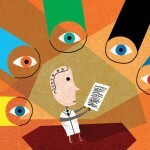 It all comes down to the pen’s value proposition. 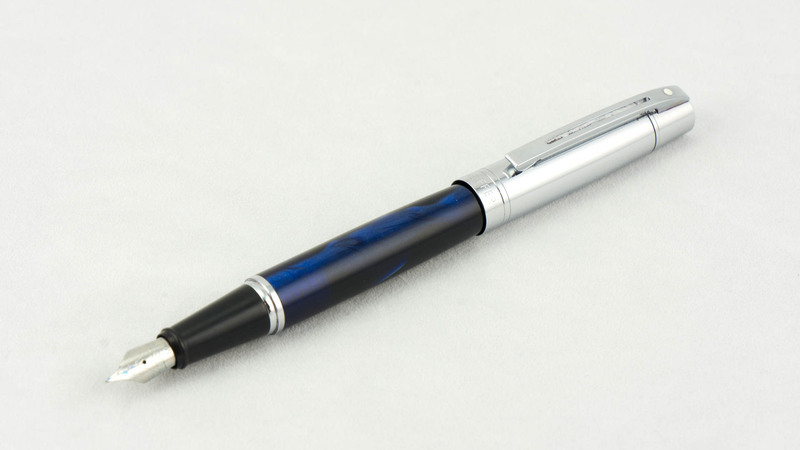 In the U.S., the retail price for this pen is about $80. It can be had for less in some retail outlets and on eBay. 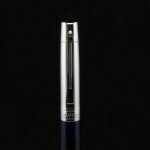 At $80, this pen is competing with the likes of the TWSBI Vac 700, the Conklin Duragraph, and the Delta Unica. I consider any of these alternatives to be a better value for the money than the Sheaffer. 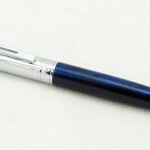 If you are able to get the pen for $35-40, I would consider it a much better deal at that price point. 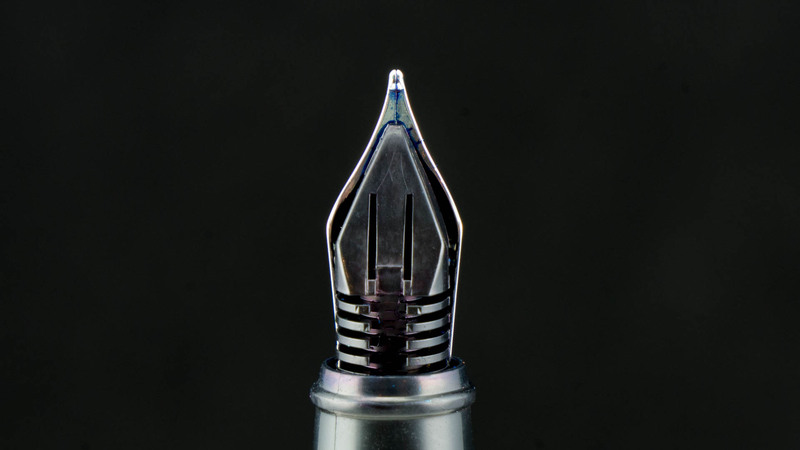 Although, even at $40, you’d still be in the same market as the Faber Castell Loom or the Monteverde Prima, or even a Jinhao x450 with a Goulet replacement nib. 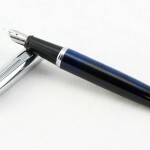 It’s hard for me to see much in the Sheaffer that helps to justify the $80 price tag.